A genius of post-war European art. A friend of Alberto Giacometti. A man who embraced eroticism and love in equal measure. 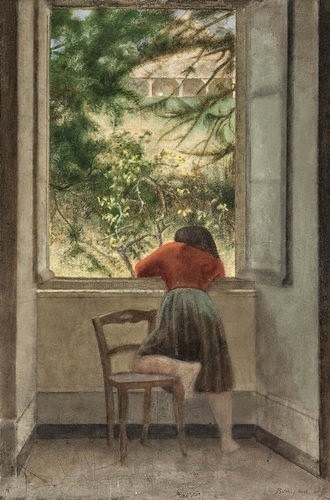 Balthus. He spent his life on creation, travel, but readings about the artist draft an image of his best days. These were the times he spent with Setsuko, an embodiment of a woman, wife, muse and frame of Balthus's works. Sharing their worlds of intimacy and inspiration in Villa Medici and in a Swiss chalet, they created art emerging from mutual respect and curiosity. She, exploring the culture of the old continent, he, learning about the Orient, painting Shunga-infused acts. In the last 17 years of his life, Balthus painted only 13 works, probably none of them masterpieces, that's what the critics would say. But I do not need a proof in a form of papers and letters to believe Balthus was a man who harnessed art. He has achieved it and built a home of his own that he cherished and loved. He described it with strokes in 'The Mountain'. A home where he and Setsuko kept a room locked, filled with exotic birds.